Boston Marathon bombing suspect Tamerlan Tsarnaev purchased two "lock and load" pyrotechnics in February from a fireworks store in New Hampshire, CBS News has learned. 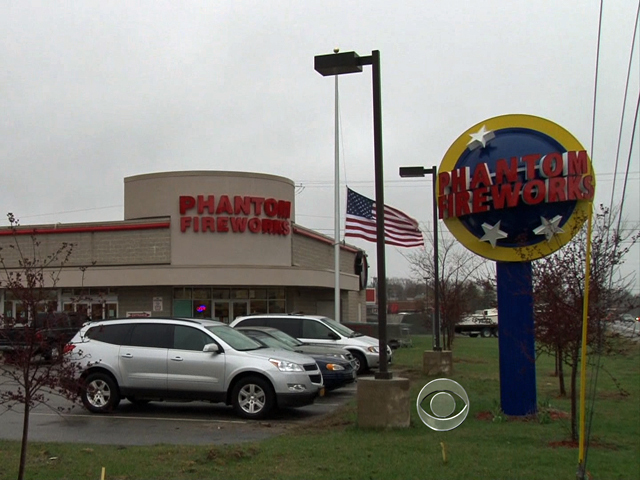 William Weimer, vice president of Phantom Fireworks, confirmed that the now-deceased bombing suspect purchased the fireworks on Feb. 6 at the company's Seabrook, N.H., location. He said that each firework has 24 shells containing 60 grams of composition of powder, half of which is black powder. Weimer said that he does not believe what was purchased was enough to be used in bombs. He said he does not have video of Tsarnaev because after 10 days, it is reused and recorded over. The company does apparently have a scan with information from the older brother's driver's license. Megan Kearns was the store clerk. "I do remember [Tsarnaev] asking --first, him having the accent--and then him asking for the biggest, loudest stuff," she told CBS News, "and I showed him one other product. But he definitely stressed that he wanted the biggest, loudest stuff." As CBS News correspondent Bob Orr reported, investigators are now trying to determine if the brothers used the black powder from those fireworks as the explosive in the pressure cooker bombs. He also added that there are key remaining questions for investigators involving the bombs: Where did the brothers build them? Did they ever set off practice explosions? How did they pay for the materials and do all of that under the radar. New pictures also surfaced Tuesday of the early Friday morning shootout between the Tsarnaev brothers and police in Watertown, Massachusetts. The photos taken from inside a house, overlooking the scene of the gunfight seem, to show the brothers crouched in front of a Mercedes SUV they had carjacked. One of brothers appears to be holding a gun with both hands in front of his body. A second car belonging to the suspects can also be seen in the photo with a passenger side door open. Witnesses says during the shootout, the brothers seemed to retrieve ammunition and explosives from that vehicle to use in the ongoing battle. Tamerlan Tsarnaev was killed in the confrontation. But his younger brother Dzhokhar survived and is now in fair condition in a Boston hospital with multiple gunshot wounds. Was NYC next target for Boston bomb suspects? Meanwhile U.S. officials said Tuesday that the elder Tsarnaev brother was an ardent reader of jihadist websites and extremist propaganda, adding another piece to the body of evidence they say suggests the two brothers were motivated by an anti-American, radical version of Islam. As he lay in his hospital bed with a gunshot wound to the throat, Dzhokhar, 19, was charged on Monday with carrying out the bombing with his older brother. Tsarnaev could get the death penalty. On Tuesday, two officials said the older brother frequently looked at extremist sites, including Inspire magazine, an English-language online publication produced by al Qaeda's Yemen affiliate. The magazine has endorsed lone-wolf terror attacks. The next step in the legal process against Tsarnaev is likely to be an indictment, to which federal prosecutors could add new charges. State prosecutors have said they expect to charge Tsarnaev separately in the killing of a Massachusetts Institute of Technology police officer who was shot in his cruiser Thursday night on the campus in Cambridge. A probable cause hearing  at which prosecutors will spell out the basics of their case  was set for May 30. According to a clerk's notes of Monday's proceedings in the hospital, U.S. Magistrate Judge Marianne Bowler indicated she was satisfied that Tsarnaev was "alert and able to respond to the charges."  Dzhokhar Tsarnaev had gunshot wounds to the head, neck, legs and hands when he was captured hiding out in a boat in a backyard in the Boston suburb of Watertown, authorities said.  One of the brothers  it wasn't clear which one  told a carjacking victim during their getaway attempt: "Did you hear about the Boston explosion? I did that."  The FBI said it searched Tsarnaev's dorm room at the University of Massachusetts-Dartmouth on Sunday and found BBs as well as a white hat and dark jacket that look like those worn by one of the suspected bombers in the surveillance photos the FBI released a few days after the attack.